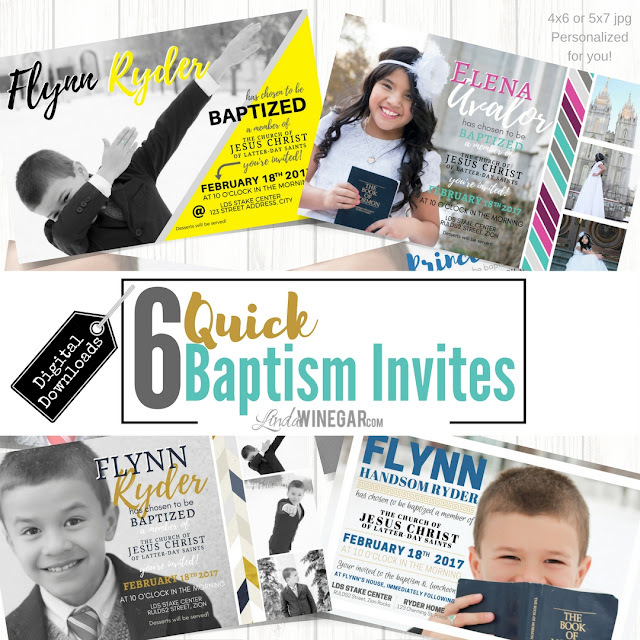 6 Quick LDS Baptism Invites! Order any from LindaWinegar.Etsy.com. Same day service! I love to design anything and everything! 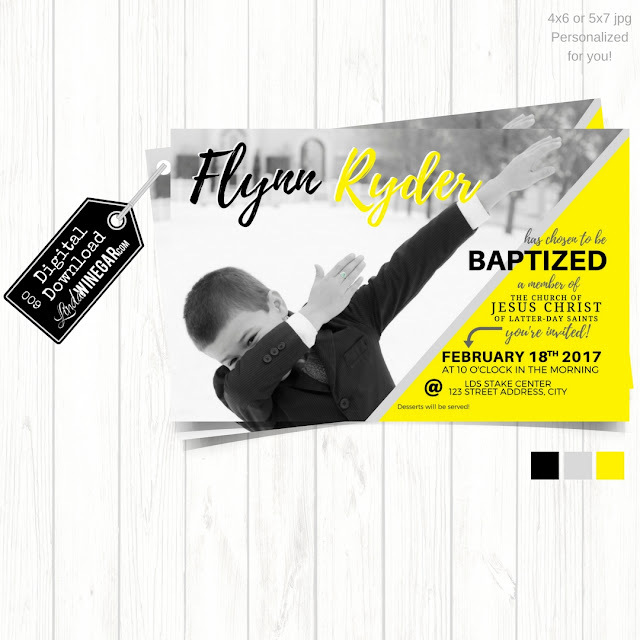 So naturally I got to design my niece's & our son's baptism announcement and I had the awesome opp to also be the photographer for both! Yep, these kids are young! If you are not familiar with baptizing at age 8, you might think we're crazy because they are too little to make that kind of commitment. Maybe, if you don't educate them enough... here's the shortened version. 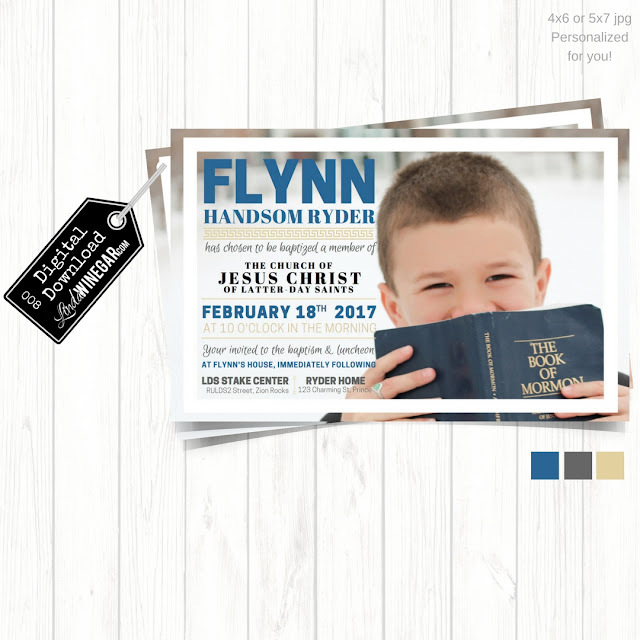 My family & I belong to The Church of Jesus Christ of Latter-Day Saints and we believe children at the young age of 8 can and are able to choose whether or not they want to be baptized. No, it's NOT because their friends are doing it!! 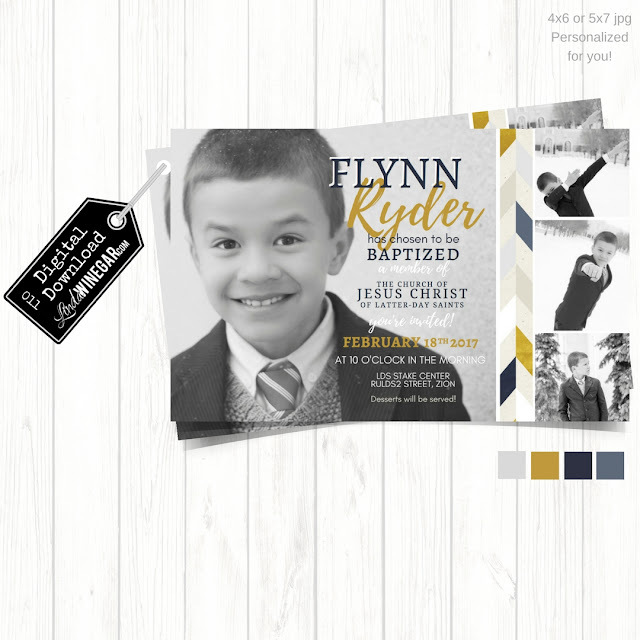 My son's BFFs and cousins have been baptized way before our son, however, my son did not want to be baptized and we told him we'd support his decision, but that also meant we needed to help educate him a bit more so he could understand what choice he was making. You have to give them all the info, not keep them in the dark, so they can decide for themselves. He was worried because of the huge responsibility it was, he knew what was expected and no 8yr old really wants more responsibility, especially our son. LOL As he set a goal to finish reading the Book of Mormon, attended his primary classes on Sundays, participated in family scripture study, family home evening lessons & home teaching visits and asked lots of questions, he's learned that being a baptized member isn't just about the responsibility to bear Christ's name, but about the protection and blessings we can receive from our Father in Heaven as we choose to covenant and make special promises with Him. He finally did choose to be baptized and we, as his parents, were so proud that he did. What a magnificent blessing to extend to a child, to OUR child, and God loves His little children. 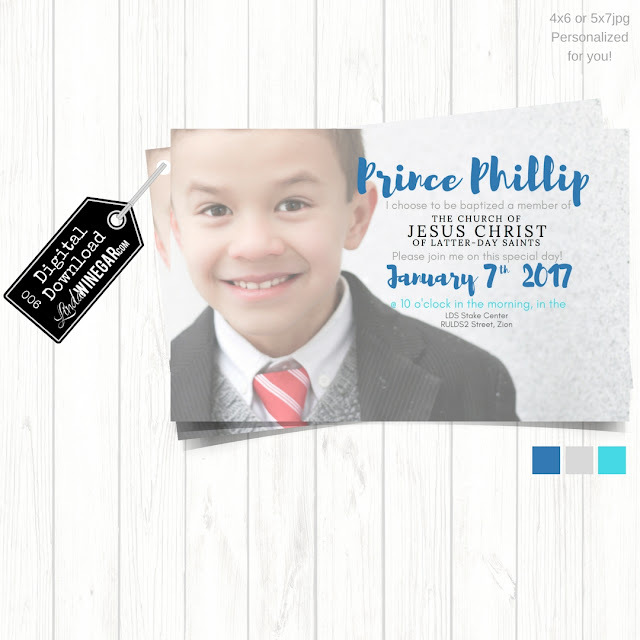 Isn't it wonderful to know that Heavenly Father offers to 8-year-olds, upon reaching the age of accountability, the privileges, promises and protections that come with baptism into His church?! I for one am so grateful he can get that extra added protection. On another note, I've just opened up my very first Digital Products Etsy Shop and I can't believe it took me so long, its my fave thing to do! One of my BFFs Madisen, has the kindest heart and is planning to go to Haiti to help children who have been rescued from child trafficking. :'( She is also serving countless other organizations without getting paid, she is a Teacher's Aid and goes to BYU-Idaho Full time, and literally has no more time to go out and get a job to fund her many humanitarian efforts. So, I decided, ALL PROCEEDS FROM MY ETSY SHOP, UNTIL MARCH 4th GO TO HELP HER GET TO HAITI! She's working with OperationShield.org. I literally could not think of any other way to help her and praying about it led my entrepreneurial mind of mine to realize this talent & passion of mine has been under used and hopefully not too late, but maybe this can help her. 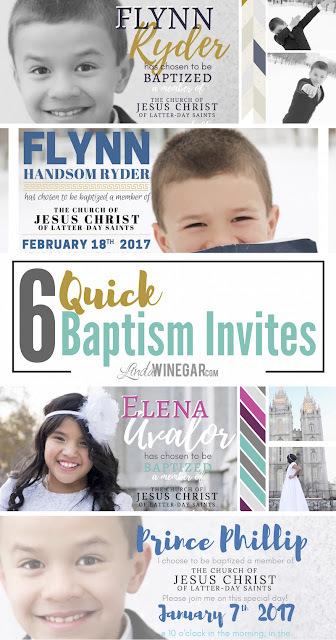 6 Quick Customizable LDS Baptism Invites! Go to my Etsy Shop and I will customize them for you ASAP! 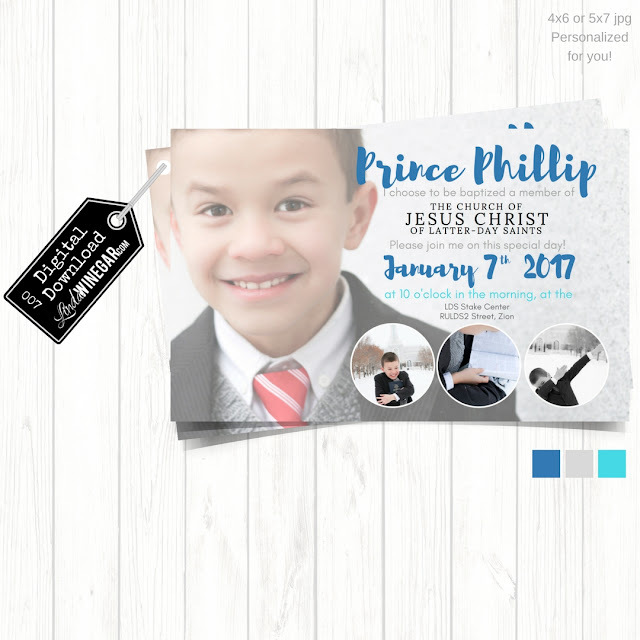 After your order I'll send you my cell number so you can text me immediately after purchase so I can start working on your invites! Because I know how last minute some of us are because we try and squeeze many good things into our days. 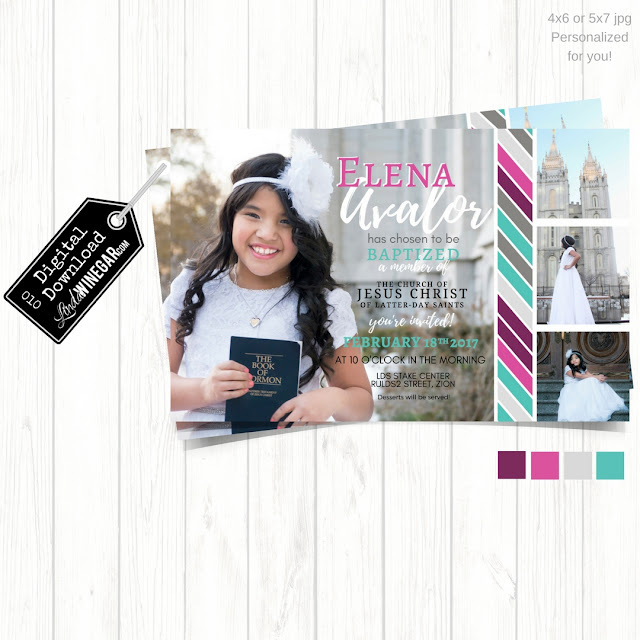 I had so much fun designing these, let me customize one of them for you!